Conserving the biodiversity of the earth’s ecosystems is one of the biggest challenges facing mankind today. According to WWF, the loss of wildlife species is estimated to be up to 10 000 higher than the natural extinction rate, with the world’s wildlife having been reduced by half in less than a generation. Coupled with this is the threat of climate change and the unprecedented growth in the illegal wildlife trade, which has resulted in populations of targeted species being decimated globally over the past few years. In South Africa alone, targeted species such as rhino have seen losses grow from 13 poached in 2007 to 1 175 last year, with 5 940 rhino being lost to poaching over the past eight years. Given the current number of animals being poached – which equates to three rhino a day – and the fact that South Africa is home to over 75% of the world’s rhino population, this is cause for grave concern. Another species being targeted in other parts of Africa is the African elephant. Tanzania has emerged as the epicentre of Africa’s elephant poaching crisis after a government census revealed it had lost a “catastrophic” 60% of its elephants in just five years with numbers dropping from 109 051 in 2009 to 43 330 in 2014. The losses were however not uniform, and were at their worst in the Ruaha–Rungwa, Malagarasi-Muyovosi and Selous-Mikumi ecosystems, which all lost more than two-thirds of their elephants. This slaughter continues. The global trade involves hundreds of millions of wild plants and animals from tens of thousands of species. To provide a glimpse of the scale of wildlife trafficking, WWF (www.panda.org) states that there are records of over 100 million tonnes of fish, 1.5 million live birds and 440 000 tonnes of medicinal plants in trade in just one year. Astounding statistics indeed. New ways of thinking through scalable methods and prototypes that deliver results. According to an article recently published by social and environmental entrepreneurs, Nelson and Harris, in the Stanford Social Innovation Review, “There is no doubt that meeting today’s growing conservation challenges requires that we find new ways of thinking about and practicing conservation, rooted in solving social problems through scalable methods and prototypes that deliver results.” Challenging is the fact that each country faces its own challenges and where there may be an abundance of animals in one country, such as elephant in Botswana, this is certainly not the case in other African countries where elephant losses and wildlife crime are on the increase. The point remains that we need to come up with innovative measures that catalyse local action and reshape our thinking especially on the economic relationship between people and nature especially since certain ecosystems cannot continue to support human livelihoods at the current rates of extraction. A new study in the journal ‘Science’ finds that across roughly two-thirds of the earth, growing pressures have caused biodiversity to drop more than 10 percent. This does not take away from the fact that there have been gains in some areas with the number of national parks, private reserves and other protected areas increasing and covering more than 15% of the earth’s surface. For the most part, however, say Nelson and Harris, “there is little interaction between the conservation field and leading social enterprise networks and discourse. We need a revitalized suite of ideas and practices for fostering innovation, scaling up solutions, enabling new ways of networking and organizing, and encouraging collaborations with transformative potential if we are to make sufficient inroads to address the wholesale loss of biodiversity and decimation of ecosystems that characterize the current mass extinction episode. The future of life on earth, including that of people, will depend largely on our ability to devise, test, and scale up effective and creative conservation models at a pace that far outstrips progress made to date. A more integrated approach, in which the centrality of humans is recognized in the conservation agenda, is required. Conservationists need to fundamentally reframe conservation as a process of social and human behavioural change, and direct resources toward enabling conservationists to facilitate such changes to improve both practice and impact. Linking in with the Biodiversity Economy Strategy. In the South African context, the impact of the colonial and apartheid eras on biodiversity and habitat loss cannot be ignored. The colonial and apartheid era saw many people being dispossessed of their land, and being crowded onto small areas (homelands) with consequent severe environmental degradation. When the land was returned to communities through the Land Reform process from 2002 onwards, the land was further allowed to be degraded through a combination of means, e.g. overgrazing with the consequent habitat loss, soil erosion and bush encroachment. The contention has been made that the lack of clear responsibility for land management has played a major role in biodiversity loss and land degradation since democracy in 1994. If one then overlays local government’s weak management and implementation of environmental regulations, the environment has further been impacted through the wholesale dumping of building, domestic and other waste in open spaces on this land. There has already been significant opportunity cost because of the ongoing biodiversity and habitat loss on this land. The Department of Environmental Affairs (DEA) in South Africa has realised the socio-economic and transformation potential of this land for rural poor black communities, and has embarked on an ambitious initiative, through the National Biodiversity Economy Strategy, to rehabilitate the land, restore biodiversity and support communities throughout South Africa to develop local wildlife/biodiversity-based economies. These local economies could contribute greatly to reducing poverty, enhancing food security and climate change resilience, whilst providing livelihood alternatives in areas where there is virtually no local economy to speak of. In terms of biodiversity value, this land estimated to be in excess of 10 million ha., once restored, can play a major role in conserving biodiversity, providing protected space for threatened and endangered species and contributing public good benefits through functional ecological infrastructure. The Southern African Wildlife College’s goals and business strategy are aligned to the National Biodiversity Economy Strategy and furthermore, the SAWC is integrally involved in the planned rolling out of the government’s strategy to transform the biodiversity economy in South Africa. However, models need to be created to incentivise and train people at different scales to change their behaviour in ways that foster the sustainable use of natural resources and ecosystems and reshape the economic relationship between people and nature. Policy and institutional reforms, which often require systems change through collective efforts, are imperative. Above all, we need to ensure solutions to today’s conservation challenges are both transformative and scalable. 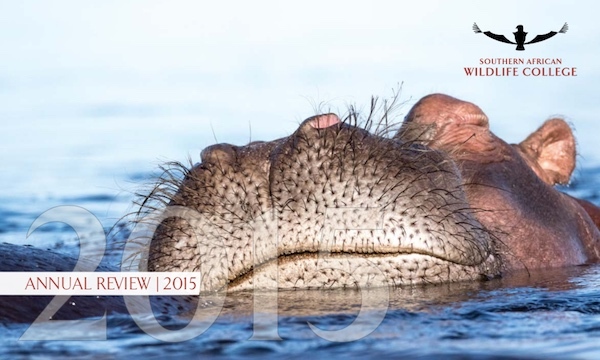 See the Southern African Wildlife College’s comprehensive 2015 Annual Review by clicking here.